I have recently been playing a round with a free app Flowd (available on iPhone, Android and Nokia devices) on my iPhone and I have to say it is pretty cool. If you are a music lover or someone that likes to share your interests/likes/dislikes with friends, then this is definitely an app that you should try out. Flowd allows you to set up private messaging sessions with your friends where you can talk about and share music, decide on which club/gig your going to on the weekend, plus also check out and ‘follow’ your favourite artists. Flowd’s social networking features of course span outside of private chats and users can also ‘check-in’ to places, share pictures and connect directly to their other social networks e.g. Facebook and Twitter. As a reward for these social interactions, fans of Flowd will receive exclusive rewards via the apps Frequent Fans platform – recent reward examples include a mobile coupon for Britney Spears Til the World Ends single and an exclusive to Flowd track from DJ Alex M.O.R.P.H. 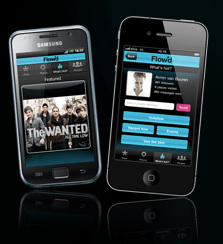 The neat thing about Flowd is that is also is a great hub for budding and established artists to share content with and reward its fans/followers via special offers – similarly to the above, these could be free tickets to a gig or free downloads of a track. Soundcloud and YouTube integration means that artists can share video/audio content easily and fans can view them seamlessly without leaving the app. You can download the free app instantly from your app store (iTunes, Android Market and Ovi) or check it out online here. Once you’ve created an account you can start following your favourite artists, hook up to and share on Facebook/Twitter and start making recommendations on music, gigs and clubs. Previous Previous post: Family Tech: The battle of the living room. Next Next post: Lady Geek TV is back – The Security Show!